A quick fun bit with a coin, the coin snort provides a laugh while demonstrating the magician’s skills. The magician produces a coin and explains that it is not as solid as it may appear. In fact, the magician claims, the metal of the coin is faulty and he can prove it. Taking the coin in his left hand, the magician raises the hand to his nose and noisily snorts it right out of his hand, which is shown to be empty. After a rub with his right hand on the nose, the magician again lifts the left hand to his nose to politely block a sneeze - and the coin flies out of his nose and into his right hand! Using a finger palm the magician first retains the coin in the right hand and then secretly transfers it to the left for reappearance. A coin and a bit of acting. This is one of those wonderful bits that can be done anywhere with no advance preparation. The magician should be 100% comfortable with the finger palm, French drop, or some other method of making a coin vanish while retaining it in the starting hand. This, plus a secret transfer of the coin, is all that is required to get a laugh, along with a bit of acting. The magician produces a coin and begins to spin his tale of faulty metals, pixie dust, alien rays, or whatever he likes to set the scene. This trick can be done with any relatively small object that the magician can palm well, but a coin works great and can be borrowed from a spectator. The coin is passed out for inspection, and then the magician holds out his right hand for it to be returned. 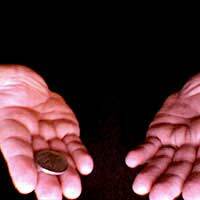 The coin will be placed likely close to the fingers for a finger palm set up - if not, a few bounces as the magician says “it even feels like the normal weight - but don’t be deceived!” can position it just right. The magician should casually “take” the coin in his left hand, performing the finger palm sleight and then raise his left hand to his face, covering his nose. A big snorting sound should take place, perhaps rubbing the palm of the left hand against the nose as if the coin is really being forced in. As the coin was never in the left hand, this action can be performed with all confidence. It will appear as if the magician just inhaled the coin. The left hand should drop to in front of the waist as the right hand comes up to rub the nose - the magician should be making faces as if he had a foreign object just jammed into his nasal passage. Here is the key to making this trick work - as the hands pass each other, a quick toss will transfer the coin from the right to the left hand. The right hand is now shown empty as it rubs the nose. The left hand comes back up to cover the nose as the magician makes a pre-sneeze face. A big sneeze should accompany dropping the coin from the left hand and the right hand is there to catch it after a short fall. A bit of over acting helps hide the transfer of the coin - the magician can turn his body a bit as he uncomfortably writhes about with a coin in his nose, helping to mask the transfer of the coin. Especially good if using a borrowed coin, the magician can apologise as he hands the coin back, gingerly handling it as if it had just been ejected from his nose and is in need of a cleaning.